Cat Wilson visually records a group in a Prosper Workshop in Portland, Oregon. How you present your material can change the way people experience your training. Creating an environment where people feel involved will encourage amazing brainstorming and creativity! How does a Trainer great such synergy? 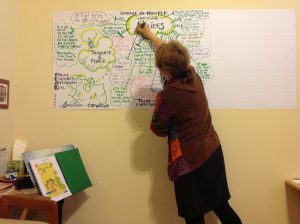 Visual Recording, Mindmapping, or Clustering. What are each of these and how do they work? Visual Recording and Mindmapping are similar. Above you can see Cat Wilson recording a colorful display of information during a class of adults working on belief change. She follows a process and a flow of information. You may notice that it looks like she’s writing on the wall (a habit she picked up when she was 2 years old). Paper is can be sticky on back or taped in a row, so the stream of thought is followed from the discussion in the room. Mindmapping is similar to Visual Recording, although it may not necessarily use “models” in a systems manner. Here you see Cat giving a class on Mindmapping vs. List-making. Typically meeting members used black pens on vertical sheets of white chart paper and make long lists for gathering meeting data. Mindmapping utilizes horizontal papers and 3+ colors (black is used for outlining or organizing afterwards). A general idea starts in the middle and lines branch out like a “cell” or “tree” figure. Mindmapping uses lots of pictures and colorful images and is great for solving problems, creating a book outline, and apparently Boeing uses it to build airplanes. Clusters are groupings of words added as a group comes up with ideas. 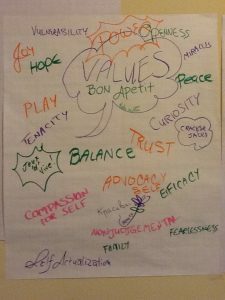 Here you see where a group added words representing values. Clustering captures ideas as they are flowing in a team, group, or meeting. Imagine that you are in a room with several participants and wanting them all to bring their skills and abilities to the table. You ask them to come up with several ideas, the come up to the wall and share them by writing them down with several colors. The colors stimulate the right side of the brain and imagination, so that the energy and stimulation in the meeting keeps the air highly active. Who could benefit from using these three devices? Creatives, Writers, Trainers, Doctors, Professionals, Moms, Kids, Teachers, and I’m not sure about Football players, but I think they already use some sort of visual play explanation which gives them a sense of active movement, too. 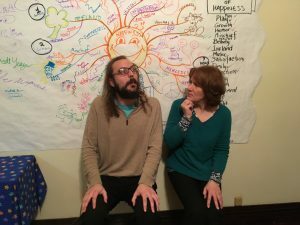 If you want a demonstration or more information on Visual Recording, Mindmapping, or Clustering, contact Cat Wilson in Portland, Oregon. After about 20 years, she has a wide collection and a fun spirit that will open your sense to creating a higher and better experience in your live. Call 503.816.5104. This entry was posted in Coaching, Self-Help, Uncategorized and tagged Clustering, Coaching, Graphic r, Graphic Recording in Portland Oregon, Mindmapping, Training, Visual Recording. Bookmark the permalink. Terrible Ideas… Don’t You Love Those? Who Lives on Your Shelf? Cat Wilson on Who Lives on Your Shelf? Nanette Bulebosh on Who Lives on Your Shelf?